ALBUM REVIEW: DAVE NACHMANOFF, "Spinoza's Dream"
It isn’t often a concept album based around the theme of classic philosophers comes along. 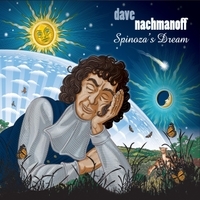 However, that’s the case with this new release from Al Stewart’s guitarist, Dave Nachmanoff, Spinoza’s Dream. Nachmanoff has a Ph.D in philosophy and here he has melded his two worlds and passions to create this interesting song cycle. “That Guy” is an upbeat opening track; poppy and with groove while “Temptation” has some definite Reinardt-esque guitar textures and “One Black Swan” has a very easy ’70’s soulful feel. The title cut, “Spinoza’s Dream” is gentle, acoustic-bodied and airy; “No Matter How Close” does, indeed, remind me of Al Stewart’s style but has a crispness all its own and to me, “Bruise On My Soul” is possibly the album’s standout with great arrangement, harmonies and powerful (yet simple) chorus. “The Painter” is another standout with its hooky melody; “Time Of War” has a clever structure of major to minor chords on the verses and some meaty Hammond and “All Good” closes out the collection in an upbeat, hopeful way (listen for the sitar lines!). Again, an interesting and different gathering of songs. Sophisticated but never pretentious or ponderous. A very fine (or actually refined) effort from Dave Nachmanoff. File under: “music for thought”.